You wake up bright and early after a good night's sleep and immediately call room service for a pot of coffee and a local paper. 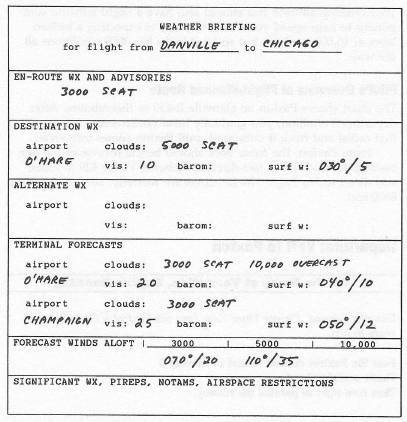 While waiting, you call Flight Service for a preliminary check on the weather, which looks just fine. Then, after lounging about for an hour, you dress and go down to the hotel restaurant where you've agreed to meet your clients over breakfast. After the three of you order Eggs Benedict—the hotel specialty—your clients indicate a slight change in their plans. They'll still be returning to Chicago today, as planned, but would like to stop at Paxton on the way back for a brief business meeting right there at the airport. You gladly agree, making a mental estimate of how much the side trip will add to the already hefty bill. The weather is clear, Paxton is a small field, and it's a flight of only about 30 miles, so you decide to go VFR for that first leg. Later on, while waiting for your clients to conduct their business at the Paxton airport, you can file IFR for the second leg and get your clearance by phone just before you leave. You have good VFR conditions, at least for now. The winds are generally easterly, so you have a crosswind from the right, but at your cruising altitude you should also have a slight tailwind component to help speed you along. Chicago is expecting a broken layer at 10,000 later on, but so far it looks like VFR conditions all the way. 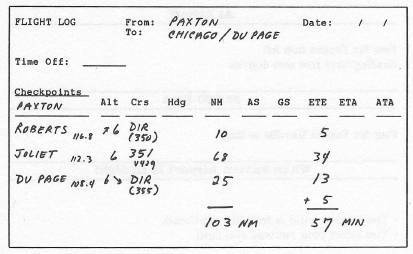 The chart shows Paxton on Danville R-250 or thereabouts. After departing Vermilion, you gradually head northwest to intercept that radial and track it outbound until Paxton comes into view. From Paxton, the route back should be the reverse of the one coming down. 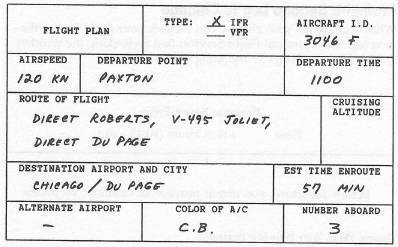 It looks like direct to Roberts, Victor 429 to Joliet, and direct to Du Page. The headings are westerly, so you figure on 6000 feet. Danville Ground, Cessna Three Zero Four Six Foxtrot VFR to Paxton ready to taxi. Then turn right to parallel the runway. Heading three zero zero degrees. Four Six Foxtrot Danville so long. The surface wind is from the northeast. You select your runway and land. You taxi to a vacant tiedown position and shut down. While waiting for your clients, you recheck your flight log for the next leg. Then you call Flight Service, first rechecking the weather (which has not changed) and filing IFR to Du Page. Before departure, you obtain provisional clearance by phone. Clearance void if not off by eleven thirty hours. The wind is still northeasterly. You select your runway and depart VFR. On climb, you turn to home on Roberts. Four Six Fox Center on one thirty-three point five good day. On one thirty-three point five see ya. Expect VOR approach to Runway 10. Four Six Foxtrot contact Tower on one two zero point niner later. You turn left to track outbound on R-248. You also begin a descent to 3000 feet. At five miles DME, you note the time and turn right to 293 degrees. Hold 293 degrees for one minute—for the procedure turn. While outbound on 293 degrees, toggle Nav 1 to R-068. After one minute, turn left to inbound heading 113 degrees. 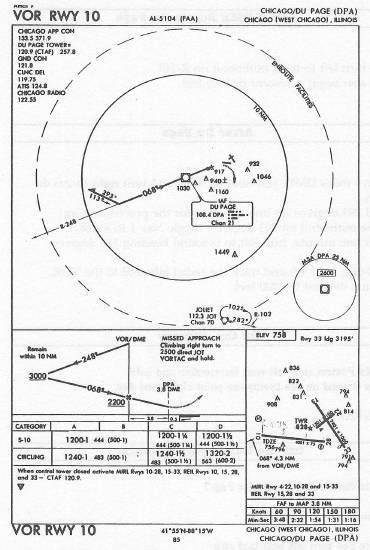 At R-068, turn left and track the radial inbound to the VOR. Begin a descent to 2200 feet. Four Six Fox Ground is that Du Page? You're cleared to the Du Page ramp.